Looking back to my post on February 13 one notes that I restored and discussed a Japanese-made, Minnesota-marketed, glass nibbed pen, sold by the Spors Company. I ran across two pens a few weeks ago, and they look very familiar when compared to the February 13 pen. The major difference is a unique feature appearing on the end of the barrels. The end piece contains a compass. It is also a lever filler, as opposed to the typical Spors crescent filler. Now the first question is, why a compass? To aid in navigation when hiking in the woods, driving on unmarked roads, plowing expansive fields, or fishing on a large lake? Could be, but my guess is that these were produced merely as a marketing attempt at something unique. These are SPORS pens, marketed by the SPORS mail order company located in Le Center, MN. For a background of the Company and its pens that were made in Japan until World War II, I will refer you to my post titled “Made in Japan” and dated 2-13-08. 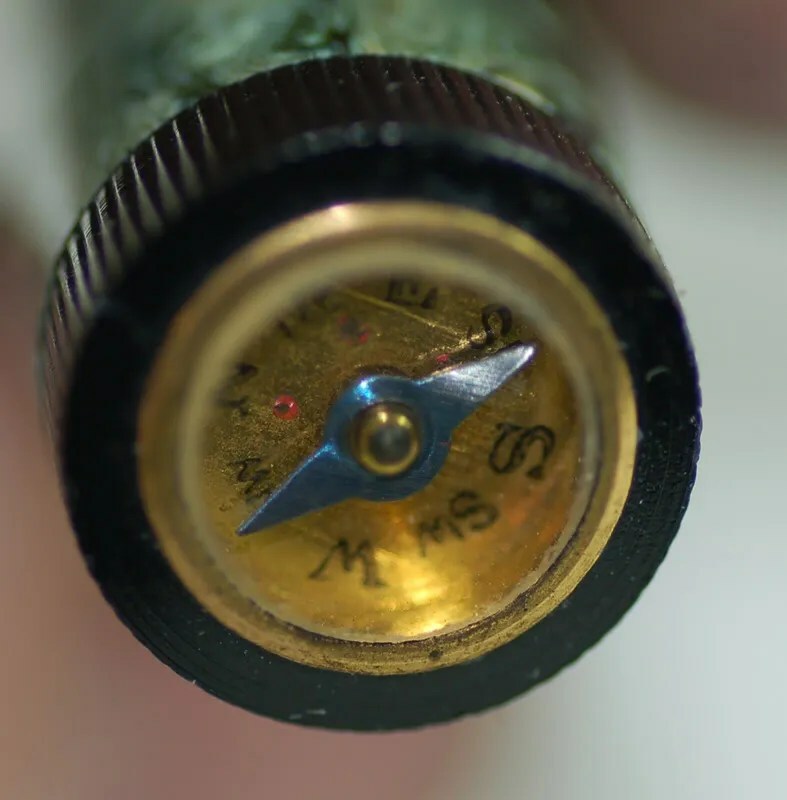 Here is a picture of the each compass on the end of each cap. The real surprise occurred when I began to take apart each pen to clean and resac. 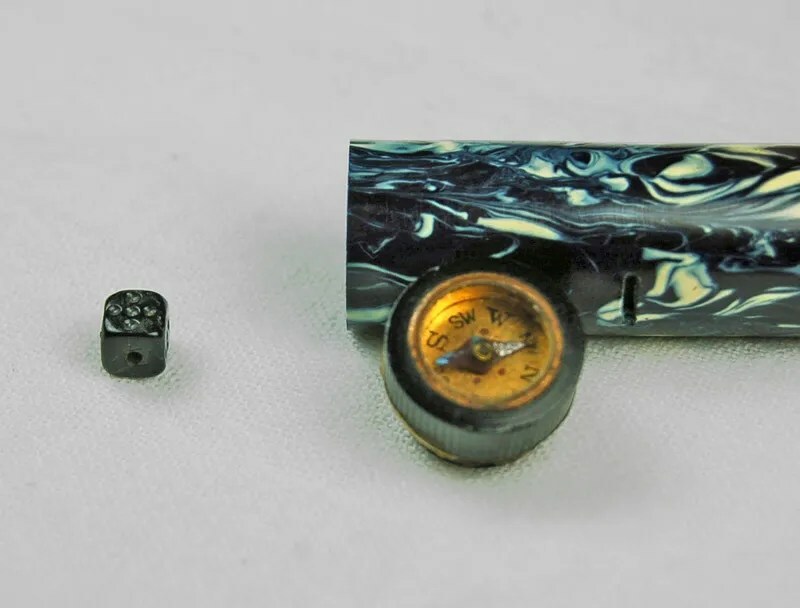 When I unscrewed the compass end cap, five dice fell out of the end of one and one die out of the other…. Ok, now we have a compass and dice in each pen. The plot thickens. 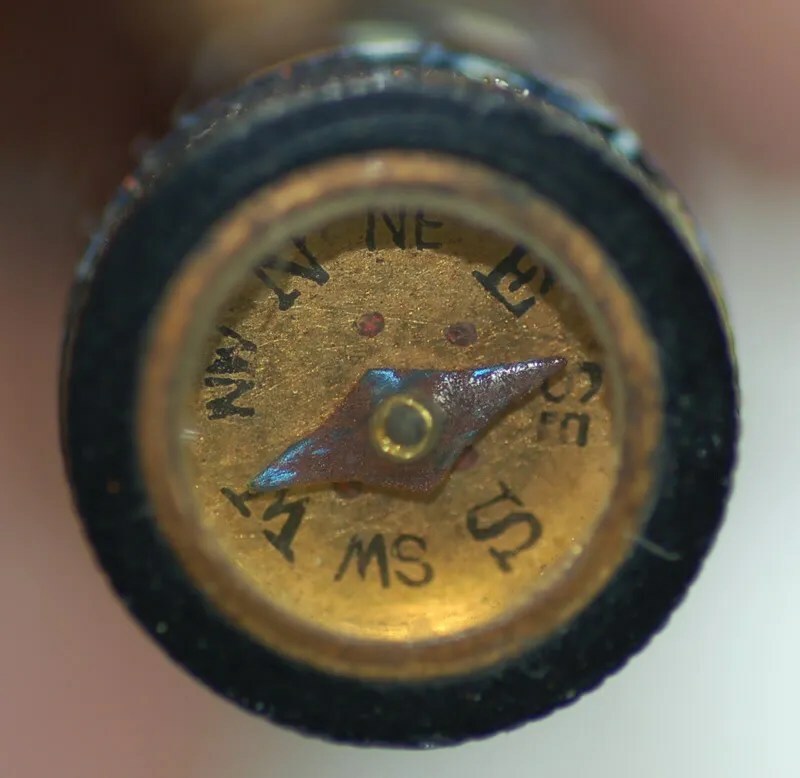 Why have dice in the end of your compass/pen? 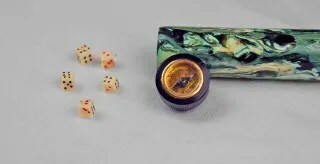 Perhaps if you are hiking and get lost, you can pass the hours awaiting rescue by playing dice? These pens certainly define “gimmick”. And they do actually write. I was able to get the sections off of each and pull out the old sac remnants. The glass nib simply screws into the section, and after placing a new sac on the section, the pens cleaned up rather well. Here is the finished product. It just goes to show that vintage writing instruments often surprise us, and even entertain us at times. That is interesting; a multipurpose fountain pen. If Spors were around today, they would probably be making mp3 music player fountain pens. Is the body of that pen made from celluloid or hard rubber? Yes, very interesting indeed and I would not have found the dice if I hadn’t taken the compass off to clean the sides. These are plastic. Perfect pen….I added a mention of your website on my blog. thanks for taking the time and care to document these pens.